BattleCON is a card game based on the mechanics of 2D fighting video games. 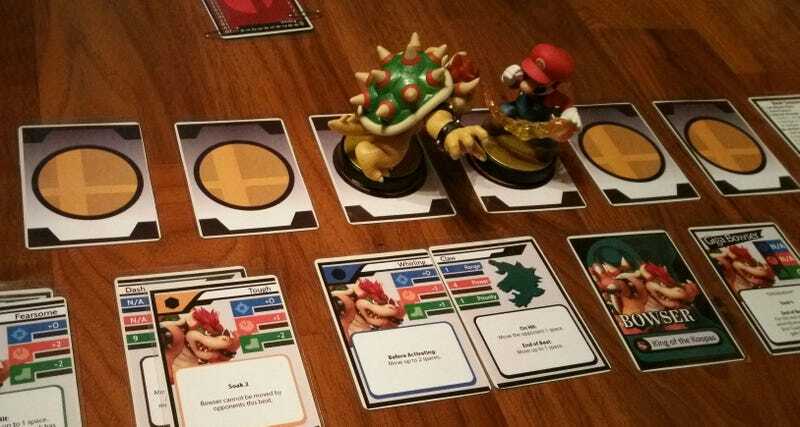 This is a fan-made mod for BattleCON that turns it into a Smash Bros. card game. Complete with Amiibo. Hell yeah. Designed by Zoql, it currently features four fighters: Mario, Bowser, Rosalina and Link. Players have cards in their hand that they play to make attacks, and there’s a small “board” that measures their movement around the “stage”. The Amiibo are just there for fun, but there’s something about seeing plastic representations of the characters—fighting, no less—that just makes the whole thing so much cooler.